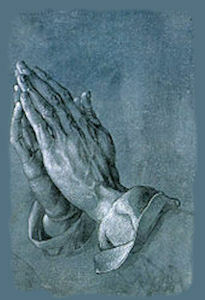 "Praying Hands" by Albrecht Durer"
Since Jesus no longer walks on this earth, He has left His representatives whom Paul said are “members of His Body, individual” (Ephesians 5:30). We are the visible members of that Body. Hands, what versatile and wonderful instruments! They can type and paint word pictures. They can scratch an itchy nose, hug a loved one, comfort a scared child, work and play. What wonders they are! They have the potential to be deadly and the gift to be creative. In the last half of the fifteenth century, two struggling young German artists, Albrecht Durer and Franz Knigstein, worked as laborers to earn money to continue their studies. Because their labors did not allow enough time to advance in their studies, they agreed to draw lots to determine which of them would continue to work and support them both—the winner would remain at his studies. Durer won, and agreed that when his studies were complete, he would return and finance the studies of his friend. Durer developed his talent and genius; and as an established success, returned to keep his agreement with Knigstein. He soon discovered the enormous sacrifice his friend had made for him. The hard labor had twisted and bent Franz’s fingers, so that he could no longer manage the delicate brush strokes required of a master painter, but Knigstein felt no bitterness; he was overjoyed at the success of his friend. One day Durer found him kneeling in prayer, his gnarled hands entwined in spiritual supplication for Albrecht’s continued success. Albrecht sketched his friends’ hands and later completed the masterpiece known as the “Praying Hands.” Durer’s masterpiece tells the story of love, labor, sacrifices and gratitude. Franz’s sacrifice faded out in time while Albeight has gone down in history as an accomplished painter, wood carver, mathematician, etc. 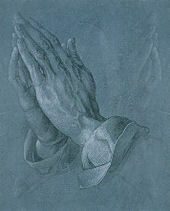 His success was largely due to unselfish acts of Franz who continued to pray for his friend’s career. One of the things we remember of Franz Knigstein is the pen and ink sketch that Durer memorialized in the famous painting, "Praying Hands." Hands were stretched out on a cross one day and were pierced with spikes to enable our hands to be free from the shame and the penalty of sin. Though those hands were sinless, they became sin for us that we could become sinless in the eyes of God. The hands of Jesus were hands of “incomprehensible love, labor and sacrifice” enabling those who would accept His love-action to be the successful ones, free from the debt of sin. He did all the work so we could be free to pursue everlasting life through Him. The nail-scarred hands were raised from the dead, ascended to the right hand of the throne of God to make intercession for us. “And hath put all things under his feet, and gave him to be the head over all things to the church, which is his body, the fullness of him that filleth all to all” (Ephesians 1:22-23). Now His Hands are on earth—in the body of Christ. Take a good look at your hands. Turn them over and see the nail scars. We are His Hands! See them as such. When you touch the shoulder of a troubled traveler with compassion, it is His Hand. When you reach down and pick up one who has fallen by the wayside, it is He who lifts that one up and brings restoration. When you extend your hand in love and fellowship, it is His Hand which has infused yours with His agape love. Never look at your hands without seeing His. When you see His Hands, your hands will be healers, helpers, encouragers and live-givers. They will never hurt, harm or destroy. We are the members of His Body, His Hands, His Feet and filled with His Love to act as He would Himself. Practice seeing His Hands in your palms, His Fingers, His nail scarred Wrists that were sacrificed for your success and eternal blessings. Now, reach out His Hand that is at the of your arm, take mine as I reach and take another. We can encircle the world with His Hands creating an aura of love like this world has never seen before. If you would like to add a banner for either of my websites to yours, copy banners below and paste to your page. Please send me the link to the location on your website. This is my other website. This is our church website. Visit us. Add banner to your website (let us know if you do).